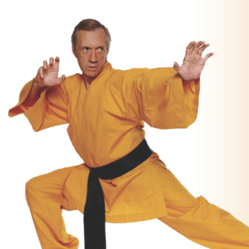 From the Kung Fu TV series to Quentin Tarantino’s Kill Bill franchise, David Carradine has made his footprint in the Hollywood entertainment annals. The Hollywood Museum presents a new exhibit "The Barefoot Legend: David Carradine - A Contemporary Renaissance Man," celebrating his life and award-winning career, on display now through September 2013. “The Hollywood Museum is thrilled to present this milestone exhibit showcasing David Carradine's many awards and his exciting, fast paced professional and personal life,” said Donelle Dadigan, President and Founder, The Hollywood Museum. From the Kung Fu TV series to Quentin Tarantino’s Kill Bill franchise, David Carradine has made his footprint in the Hollywood entertainment annals. 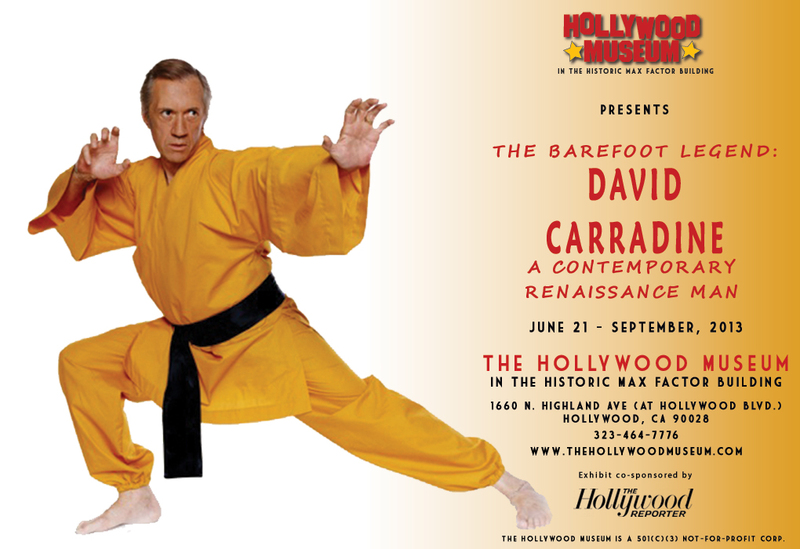 The Hollywood Museum presents a new exhibit "The Barefoot Legend: David Carradine - A Contemporary Renaissance Man," celebrating his life and award-winning career, on display June 21 through September 2013. The David Carradine Exhibit, co-sponsored by The Hollywood Reporter, will include iconic costumes, props, and materials from Kung Fu to Kill Bill and presents imagery and artifacts from David’s life as an actor, artist, and musician. The Hollywood Museum in the Historic Max Factor Building is located at 1660 N. Highland Ave. in the heart of Hollywood. "The Hollywood Museum is thrilled to present this milestone exhibit showcasing David Carradine's many awards and his exciting, fast paced professional and personal life," said Donelle Dadigan, President and Founder. "The first of its kind to capture the many facets and talents of this truly contemporary Renaissance man, the exhibit is here for the public and fans to experience this summer." A member of one of Hollywood’s acting dynasties, David Carradine followed his father, John, a well-known star of screen and stage dating back to Hollywood’s Golden Era into the "family business." He appeared in 200 films, 27 TV movies, 32 plays, 35+ guest appearances, and three TV series. Besides his acting talents and career, Carradine was a musician (written and recorded over 60 songs), artist, pilot, fitness pro, master of martial arts, and an author. A four-time Golden Globe© nominee, Carradine received a star on the Hollywood Walk of Fame in 1997. He was nominated for a Primetime Emmy© for Best Actor in Kung Fu (1973); and was awarded a Golden Boot Award (1998); Capri Legend Award (2004); Saturn Award (2005); Lifetime Achievement Award at the Action on Film International Film Festival (2005); among many other recognitions for his work. The exhibit will include clothing and accessories from Carradine’s vast personal wardrobe and signature costumes and pieces from his role as Kwai Chang Caine in the 1970’s television series Kung Fu. His extensive personal sword collection as well as the original Hatori Hanzo sword used in Quentin Tarantino’s Kill Bill will also be displayed. The Hollywood Museum, the official museum of Hollywood located in the Historic Max Factor Building, spotlights the Legends of Hollywood with the most extensive collection of authentic Hollywood memorabilia in the World. The museum features four floors of breathtaking exhibits and is the home of more than 10,000 authentic Showbiz Treasures, one-of-a-kind costumes, props, photographs, scripts and vintage collectibles from favorite movies and TV shows. The museum includes costumes from Marilyn Monroe Angelina Jolie, Brad Pitt, Leonardo DiCaprio, Jennifer Lopez, George Clooney, Elizabeth Taylor, Jean Harlow, Elvis Presley, Michael Jackson and more; Props from ‘Gone With The Wind,’ ‘Star Trek,’ ‘Planet of the Apes,’ ‘Star Wars’ and ‘Jaws.’ Star cars collections including Marilyn Monroe’s limousine. The Hollywood Museum is located in the heart of Hollywood in the historic Max Factor Building on the corner of Hollywood & Highland, where Hollywood’s make-up king, Max Factor, worked his magic on stars since the 1930’s. See where Marilyn Monroe became a blonde and Lucy a red head! Visit the Dungeon of Doom for a spine tingling walk through Hannibal Lecter's jail cell from ‘Silence of the Lambs.’ See Boris Karloff's mummy, Vampira, Frankenstein and his bride, Elvira--Mistress of the Dark, Jason, Freddie, Chucky and other cult horror film favorites. The Hollywood Museum is a 501(c)(3) non-profit organization. Private tours available by advance reservation.